Nicole was born and raised on the Big Island of Hawai‘i. She currently attends Northern Arizona University in Flagstaff, Arizona and will be a junior in the fall, pursuing a Bachelor of Science degree in mechanical engineering. She hopes to work in the renewable energy field to increase self-sufficiency. She is also interested in mentoring high school and middle school robotics teams to help encourage and educate them about the STEM fields. The Canada-France-Hawaii Telescope (CFHT) has a model of its telescope that has not been maintained for years but it would be a stimulating addition to outreach. 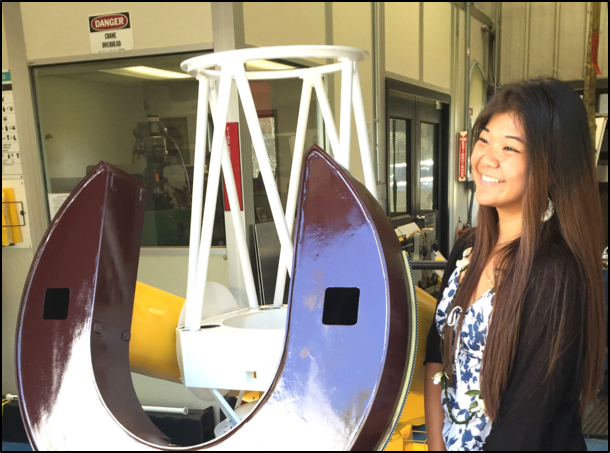 CFHT’s outreach includes work with programs to encourage Hawaii’s youth to be involved in astronomy and other STEM fields. The model needs to be able to mimic the movement of the actual telescope in the hour angle (HA) and declination (DEC) axes and pinpoint star positions using a laser. Restoration of the model telescope was executed: cleaning, sanding, painting, replacing, and manufacturing parts. Testing was conducted on the existing motors and encoders to ensure that replacements were not necessary. A Raspberry Pi computer was programmed using Python to communicate with a Roboclaw motor controller, which was used to read the encoders and move the motors. For manual motion, a classic Nintendo USB controller is used, enabling users to move the telescope model manually. The new computer interface was paired with a planetary program that supplies coordinates to simulate the position of the telescope. The addition of a user engagement component to the model enhances the model’s impact on outreach activities. Project results will be presented.